A revolutionary new glazing product that’s no wider than standard single-glazing, yet boasts the thermal performance of double glazing. 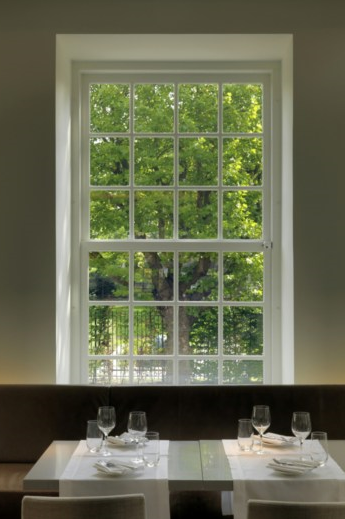 The revolutionary vacuum glazing technology provides unrivaled thermal performance for a thin profile unit that fits seamlessly into both older traditional properties to retain the aesthetics of traditional window frames and equally as a stylish solution for new builds. Pilkington Spacia™ utilises two panes of glass; an outer pane of low-emissivity coated glass and an inner pane of clear float glass. These are separated by a Micro Spacer Grid of small transparent glass pillars each measures just 0.5mm diameter set 20mm apart, robotically positioned, with “intelligent” camera checking. The edges are sealed hermetically with a low melting point glass frit, then air evacuated and capped. 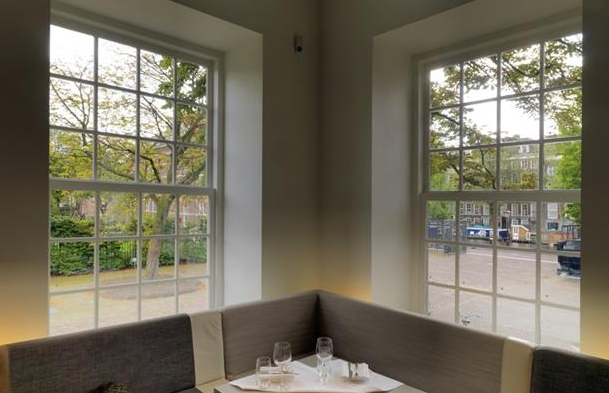 The glazing’s overall thickness of 6.5mm is enough to provide an aesthetically pleasing glazing solution where a slim profile and a thermally-efficient window are needed. Moving to glazing with a low centre pane U value whilst maintaining the high light and solar transmission associated with single glazing can save on heating costs and reduce CO2 emissions. 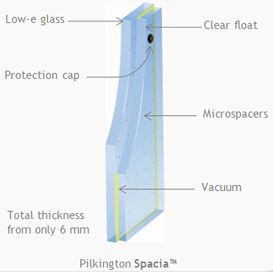 Pilkington Spacia™ is a proven technology and has already been used in Japan for over a decade. Pilkington can improve the energy efficiency of older, traditional buildings, where original frames have to be retained. At an astonishing thickness of only 6.5mm, Pilkington Spacia™ delivers an impressive 78% light transmission, and an outstanding acoustic performance of Rw (C, Ctr): 35dB(-1,-3) which is 3dB better than triple glazing. With the possibility of glazing areas as large as 2,400 X 1,350mm and a life expectancy far in excess of the 10 year warranty this is an amazing product. 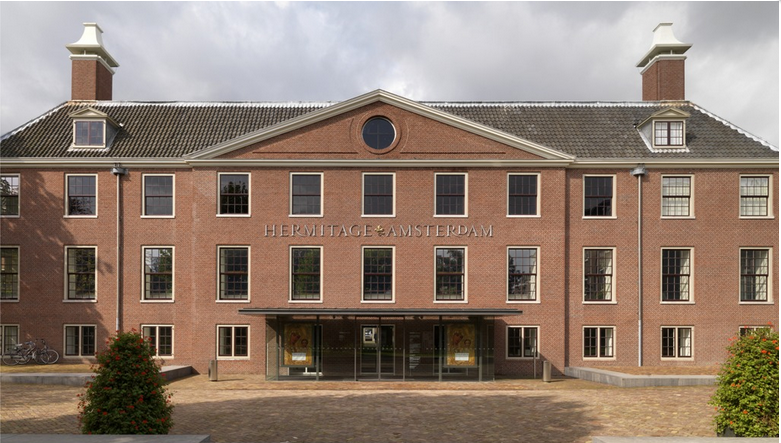 Heritage reglaze, retrofit into existing frames in period homes & buildings. “Pilkington Spacia™ is an innovative glazing product that enables specifiers to retain the original look of a property without compromising on energy efficiency. 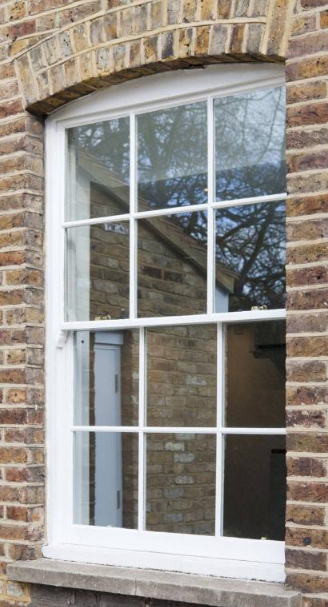 Developed specifically to be easily retrofitted into your existing window frames.The low weight of Pilkington Spacia™ allows for the upgrading of box sash windows, with very little adjustments to the operating mechanism. Five times more efficient than standard single-glazing. 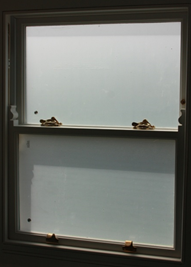 Centre pane U Value of 1.4W/m2K, thermally out performs Industry standard, a typical hard coat low-e double glazed unit. Original period frames can be retained. Maintains authentic appearance of period homes. Greater warmth and comfort all winter long. Reduced levels of internal condensation. Results in reduced heating bills and lower carbon emissions/reduce your carbon footprint. Improve your home’s Energy rating. Virtually eliminates all drafts, cold spots and condensation. Noise levels greatly reduced for a quieter home. 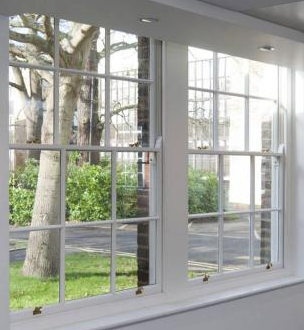 Light weight-the perfect solution for most sash windows retrofit/ refurbishments. Slim profile- gives the appearance of single glazing. – Spacia™ features the world’s first commercially available vacuum glazing – to bring a new standard of comfort and energy efficiency to older buildings. 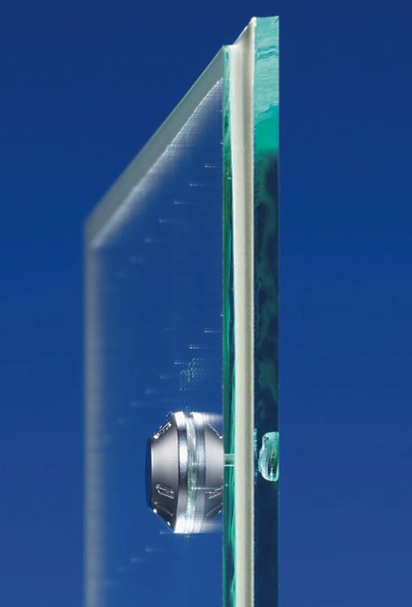 – Spacia™ vacuum glazing consists of an outer frame of low-emissivity glass and an inner frame of clear float glass. Air is extracted to create a vacuum, rather than being filled with inert gas. 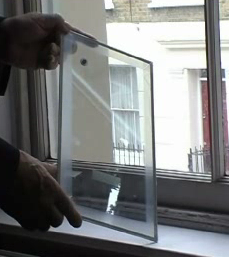 – The outer pane enables sunlight (solar gain) to pass through the window for greater energy efficiency. 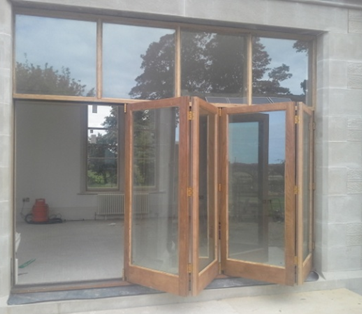 – While the inner pane is designed to reflect the heat from fires and radiators back inside. 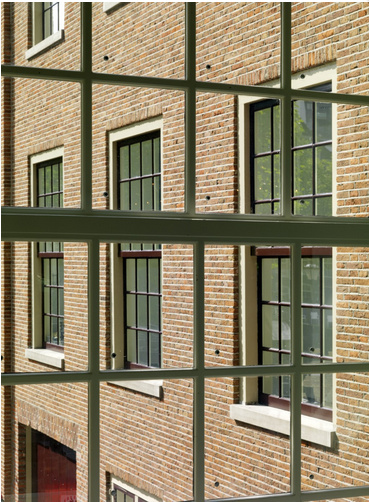 – With the industry’s thinnest profile, Spacia™ offers double-glazing comfort in a single-glazing width. This allows for improved thermal efficiency in period buildings, as well as negligible impact on the building’s historic appearance. 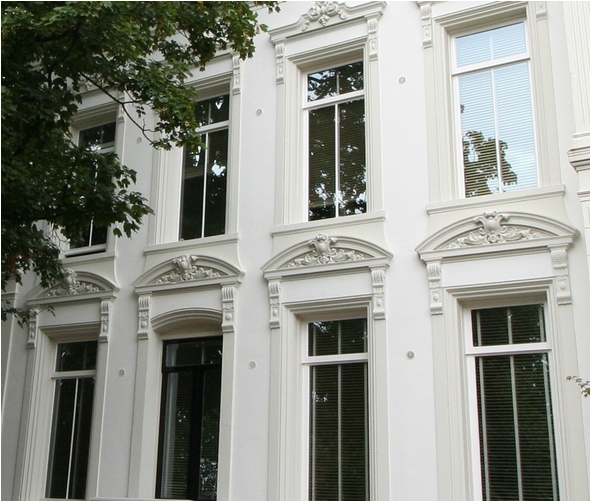 Across the UK & Ireland single glazed properties are losing copious amount of energy via their windows, APG can assist in these windows refurbishment in line with government targets and successfully maintain their listed status. 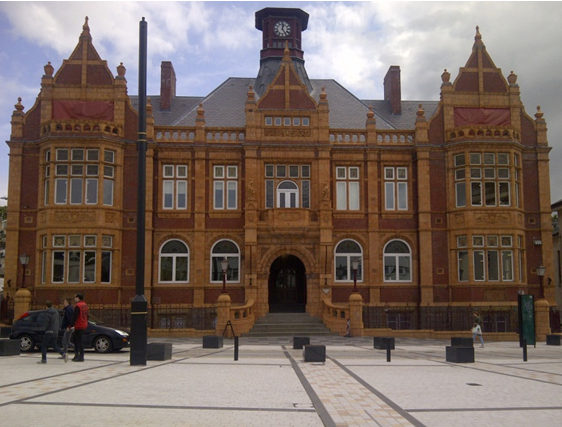 Spacia™ glass has been used in redevelopments including The Old Town Hall in Merthyr Tydfil, Milton Keynes Bus station and prestigious builds such as the Hermitage in Amsterdam 6.5mm allowed for the retention of the the original frames. 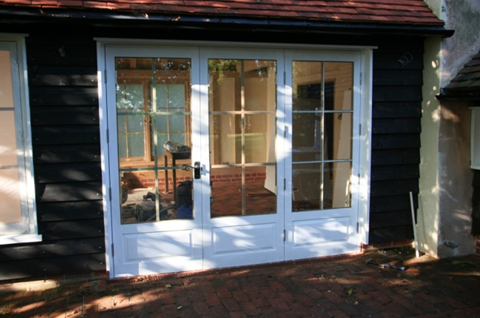 APG is a premiere glass merchant & glazing business at the cutting edge of heritage Insulated glazing units.